On Thursday 11th July Bath and North East Somerset Council voted unanimously to express serious concerns about the development of unconventional gas in the area, to research it fully and to explore measures to control and if appropriate prevent its development. • Notes the work already undertaken by the Council in relation to Fracking within Bath and North East Somerset and neighbouring areas, including the Council’s response to Somerset’s Minerals Preferred Planning Options, agreed by Cabinet in April 2013, and the Council Commissioned report by the British Geological Survey. • Understands that the use of shale gas and coal bed methane has the potential to make a significant contribution to the UK’s energy needs in the coming decades during the period of transition from use of fossil fuels to renewable energy sources, and could enable Britain to become more energy independent. • Recognises the responsibility that the Council has to protect the unique hot springs, and the World Heritage Site for future generations as set out in the County of Avon Act 1982 and the Royal Charter of 1591. • Welcomes the additional safeguards as set out by the Secretary of State in December 2012. (Ref: https://www.gov.uk/government/speeches/written-ministerial-statement-by-edward-davey-exploration-for-shale-gas). – the importance of protecting the reservoir water supply in the Chew Valley. • Notes the dangers such as those outlined in the British Geological Survey report, including the serious risk that deep well Shale Gas exploration and inappropriate geothermal energy exploitation poses a to the hot springs. • Believes the Council should seek to adopt whatever measures available to control, and if appropriate prevent, the use of potentially damaging unconventional gas exploration and extraction, as well as inappropriate geothermal exploitation, within Bath and North East Somerset. 1. To request that the Leader of Council and Chief Executive formally register the concerns of Council with the Department for Energy & Climate Change relating to unconventional gas exploration and extraction and geothermal exploitation within Bath and North East Somerset and neighbouring areas regarding their impacts on the Bath Hot Springs, the environment, the reservoirs of North East Somerset and other water supplies throughout the wider area. 2. To request that Cabinet ask Officers to continue to work on this issue within the Placemaking Plan and to produce a report, in advance of the completion of the Placemaking Plan, on the study/ies that informed the development of the planning policy framework for dealing with the potential impact of unconventional gas exploration and extraction, as well as geothermal exploitation within Bath and North East Somerset in the context of the National Planning Policy Framework, and report back to full Council. This will include a summary explanation of the potential impact and risks of unconventional gas exploitation and geothermal energy exploitation within Bath and North East Somerset, taking account of the report produced for B&NES by the British Geological Survey in October 2012. 3. As part of the report referred to in (2), requests that Cabinet report back to Full Council on measures available to the Council to control, and if appropriate prevent, the use of unconventional gas exploration and extraction and geothermic exploitation within Bath and North East Somerset. 4. 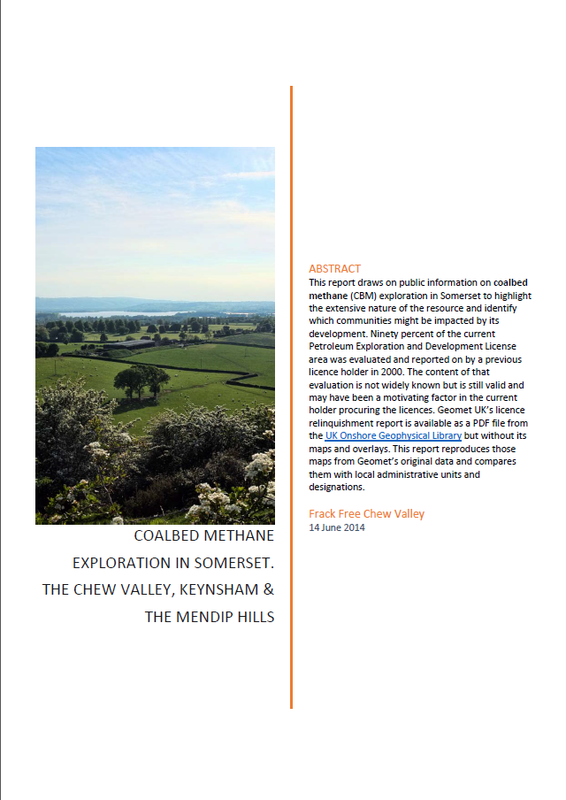 To continue to work with Somerset County Council and other neighbouring authorities, and national Government, to examine the technical and environmental issues involved in unconventional gas exploration and extraction and geothermal exploitation. 5. To continue to support the appropriate development of renewable energy systems and improved energy efficiency in Bath and North East Somerset as set out in the draft Core Strategy in order to help achieve the transition from fossil fuels to sustainable sources of energy. 6. To request that the Members of Parliament for Bath and North East Somerset convey Council’s concerns to the appropriate Government Ministers. (Sorry for the long post – but its important!) The President of the Royal Society, Britain’s national academy of sciences, has recently written on why evidence rather than rhetoric should guide key public decisions and uses fracking to illustrate his article. He makes the point that good public decision making should be based on evidence not opinions and that debate should be based on “high-quality scientific advice, which is dependent upon high-quality science … taking account of all of the evidence and not cherry-picking data”. On fracking Sir Paul says that we now have an idea of how much shale gas is in the ground but not yet how much can be got out. He goes on to say: “Crucially, we need to assess the health, safety, and local and global environmental risks some of which was done by the Royal Society and Royal Academy of Engineering last year“. He says “some of which” because the report’s terms of reference are limited to consideration of the technical aspects and associated risks only. We are often told that fracking is safe because of this Royal Academy of Engineering report, but what did this report actually say? What is normally omitted is that it says “Most likely causes of possible environmental contamination include faulty wells, and leaks and spills associated with surface operations. Neither cause is unique to shale gas. Both are common to all oil and gas wells and extractive activities.” Including shale gas. Further is says that “The probability of well failure is low for a single well if it is designed, constructed and abandoned according to best practice”. So, the Royal Academy of Engineers say that faulty wells, leaks and spills are common and that for a single well every thing is ok if everything is ok. However, the gas companies are not considering drilling a single well, they are considering hundreds and possibly thousands of wells in Somerset. So what is the probability of well failure for 2,000 wells? One in what? So far Caudrilla has drilled 4 wells two of which have been abandoned, one deformed by an induced earthquake and apparently not reported in a timely manner. So what are the human and livestock healths risks? Apparently the Health and Safety Executive will only be considering the health and safety of rig crews not the local population. Where is the report on the potential health impacts to residents? What are the global environmental risks? The Department for Energy and Climate Change are preparing a report on the greenhouse gas emissions of shale gas production which should be released during the summer. Where is the assessment of intangible costs to residents and the local authority, including the effect on property prices? The Royal Society’s In Verba Blog points out that the RAE’s report is “by no means exhaustive” and doesn’t examine the climate change implications, “nor is its assessment of risk wholly comprehensive”, and “it can’t tell us whether those events are acceptable to different sectors of society”. The report says virtually nothing about coalbed methane. Sir Paul Nurse goes on to say that these (incomplete) assessments are only the start of the debate and “we need to discuss energy security and affordability” and “Those living in shale gas areas where there might be fracking have a major stake in the decision. They are the ones who will have a big industry moving into their neighbourhoods, and they need to weigh up the disruption and potential risks against the potential economic benefits for themselves locally and for the UK as a whole. These questions are not easily answered, but what is key is to get the science right first before moving on to the politics”. Unfortunately we have had the politics thrust upon us way before the science has been established – all on the basis of the American experience. Enough said. So next time you are told that the Royal Society and the Royal Academy of Engineering say that fracking is all ok, ask for the full evidence and refer them to Sir Paul Nurse the Society’s president – a human biologist who is probably very interested in the potential health impacts.